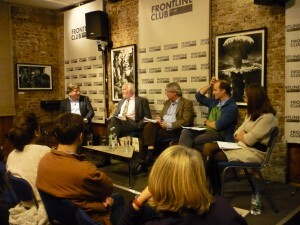 On Tuesday 27 November, a group of experts gathered at the Frontline Club to discuss the issues and nuances that surround the task of: Covering poverty in an indifferent world. This subject was recently explored by the BBC’s Why Poverty? series in an episode covering the campaigning efforts of Bob Geldof and Bono, and the resulting phenomena were also addressed by the panel. The Live Aid and Make Poverty History movements have been criticised for failing to fully achieve their ambitious aims. But today – as writer and activist Paul Vallely explained – millions of lives have been saved due to the public’s response and lobbying efforts in fora such as the Gleneagles G8 Summit in 2005. It is within this paradigm that we find a significant use of celebrity she argued.